Employee Appreciation at Trinity Transportation! Trinity Transportation takes pride in giving back to all of the hard working employees. An event outside of work was scheduled as a way for the company to thank all of the dispatchers for all their hard work this past year. 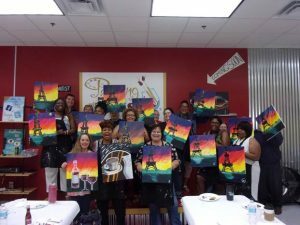 The idea of going to Painting with a Twist had come up, and Human Resources took the lead with organizing the event. Painting with a twist pairs instructional art with a lively instructor to produce works of art. Step by step instructions with experienced and enthusiastic local artists take place to make for a fun memory. Trinity Transportation plans to do fun outside of work activities like this for all of their departments as a way to give back and thank them for all of their hard work! Want to join in on the fun too? Trinity Transportation is hiring! Check out our job postings here!